I must admit I'm quite pleased with myself for all of the holiday cards I've been creating! Now, if I can get them filled out and popped in the mail this year I'll be super pleased with myself! 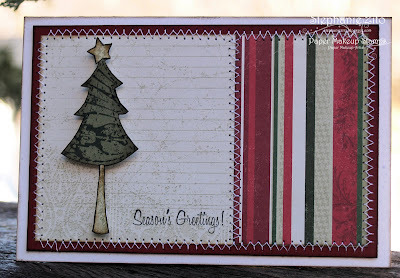 Inspiration for my card came from this week's Sketch #65 at 2 Sketches 4 You and this week's challenge at the Town Scrapper (to use no embellishments)! Products used: SU cs, LYB dp, Paper Makeup Stamps new November releases: Christmas Cheer Set and Season's Greetings Sentiment, Memento and Distress inks and machine stitching. What a delightful Christmas card - love it Stephanie! Very nice, an deceptively simple. Smart girl starting on your cards now before you're overwhelmed with all the other Christmas preparations! Love the colours on your card !